The Sennheiser XSW-D LAVALIER SET is an easy entry point into the world of wireless microphone audio for speakers, educators, panelists, and moderators looking for a stage-ready system that's both cost effective and simple to use. 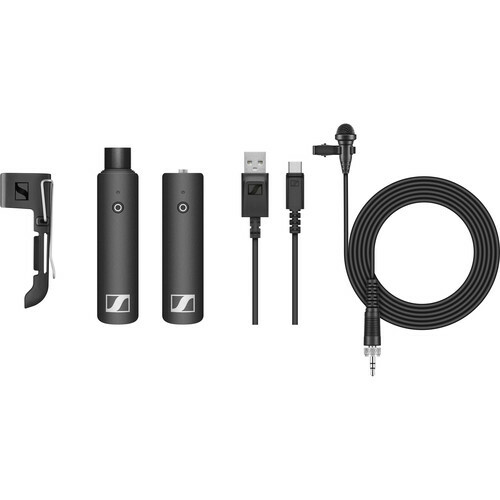 It puts world-renowned Sennheiser wireless sound quality in a miniaturized, plug-and-go, 1-button digital system that anyone can operate. Plug it in, power it up, and you're immediately up and running, streamlining your setup so you can concentrate on delivering your message to your audience with confidence. The ever-popular ME2-II lavalier microphone delivers a natural sound, optimized for speech intelligibility. Its omnidirectional polar pattern ensures that the sound remains consistent, even when the talent's head moves away from the mic. Box Dimensions (LxWxH) 9.9 x 4.7 x 2.8"
How many charge cycles is the battery rated for? Many lithium ion batteries are published with ratings like 300, 500 or 1000 charge cycles and hold 80% or more after that count. And is the battery user replaceable if it no longer functions normally? Per Sennheiser: &quot;Customers can expect up to 1000 charging cycles with minimal effect on operating time&quot; In essence it means you'll be able to rely on this system for several years. Does this kit include the hotshoe mount adapter to mount the receiver to the hotshoe of the camera? No it doesn&rsquo;t. The receiver on this particular kit is with the XLR male which is meant to be plugged into an XLR source such as mixing boards or even cameras with an XLR input. Since it&rsquo;s plugged into the XLR, a separate mounting isn&rsquo;t needed not possible. There are various other camera kits with a mini output which do come with shoe mount adapters. Does the XSW-D transmit in stereo or only mono? This would provide a mono signal like any single XLR connection microphone. Can the receiver unit receive two simultaneous channels or can it only receive from one transmitter at a time? Can you order the lavalier set with your ME-4 cardioid lav mic? Could the XLR receiver be plugged into an audio recorder such as the Zoom H5 or H6 to record audio from the mic?